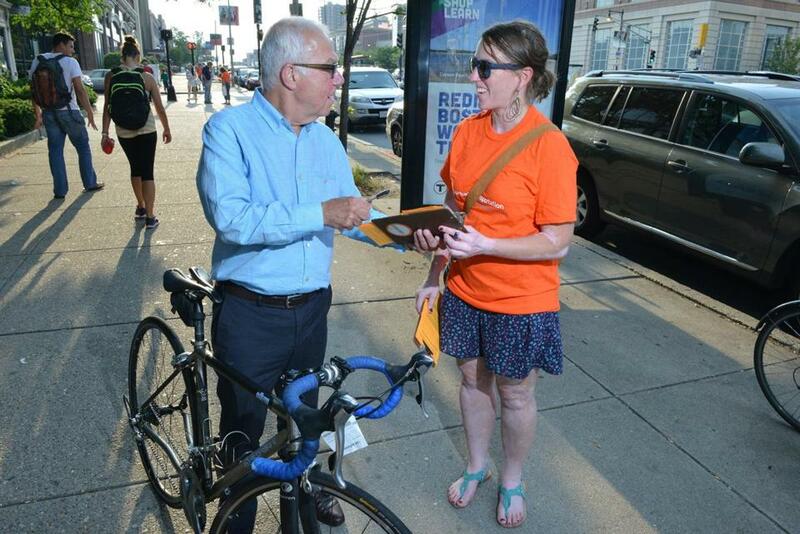 Motorists’ needs should not be driving force in plan for Commonwealth Ave.
Michael Berger spoke with Amy Ingles, a volunteer with LivableStreets Alliance, who was gathering signatures on Commonwealth Avenue in opposition to the city’s plans for the heavily traveled thoroughfare. Re “Bicyclists see missed opportunity in Commonwealth Ave. overhaul” (Page A1, Aug. 2): James Gillooly, Boston transportation commissioner, talks a good game about planning for all users on Commonwealth Avenue, but when it comes down to it, he lets on that it all comes back to accommodating cars ahead of other users. While it is important for pedestrians and bicycle advocates to remember that transit is an important user on Comm. Ave., what is the problem with a bus blocking a car travel lane? A few seconds of time for a few motorists should not come at the expense of tens of thousands of bus riders, pedestrians, and cyclists. Let’s plan for them, and if it results in a blocked travel lane, so be it. Cars are but a fraction of the traffic on Comm. Ave. In planning, they should be the last users considered, not the first.